One month ago today, I started this particular trip through Europe on behalf of Let’s Start Talking. I’ve tried to avoid making the posts during this time simple travel logs, but rather I’ve tried to record reflections as I’ve traveled. Today is different though! 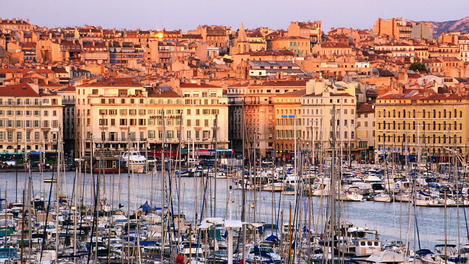 I have to tell you about the wonderful day Sherrylee and I had yesterday in Marseille, France. I began the morning scavenging the neighborhood outside our hotel for croissants and coffee for breakfast, trying to beat the $20/person cost of breakfast in the hotel. I found a beautiful little Pattisserie/Chocolateria just about a block away where I got the croissants, but I had to get the coffee in the hotel because none of the little “bars” in the area had takeaway cups for their coffee. Still it was much less expensive this way—and much more interesting. Craig and Katie Young, missionaries in Marseille for 23 years, picked us up and took us to a little eating place in downtown Marseille. I hardly remember what we ate though because we had the greatest conversation with them! Of course, we talked about their LST project that they are having this summer, but the talk quickly slipped over to life—as it often does, we find, with missionaries. It is not really the creature comforts, the lifestyle, or anything material about “home” that missionaries really sacrifice when they move to a foreign country (and most would be embarrassed even using the word sacrifice), it’s the deep relationships with other Christians and opportunities to share with people who have had similar experiences that they miss. To whom do they turn when they want to talk about what it will be like to have a baby in their new home, to start school with their six-year-old, to face high school years in a country that you have never experienced high school in?? What do you do when your children start leaving home and going off to college in America? What do you do with elderly parents when you live a continent away? What do you do when your children are seriously dating people they’ve met, but you’ve never been closer than 5000 miles to the person they are falling in love with? To whom do they turn when suddenly their body starts slowing down: is this normal, is this allowed for missionaries? How do they explain that to their sponsoring church? “I need to do less,” might not go over so well? “I need to come to the States more often to see my children—or my grandchildren!” Will their supporters go for that? Our mission partners are leaving—now what are we supposed to do? Stay by ourselves? Start over somewhere else? And who can they talk to about these things? These are the kinds of conversations Sherrylee and I have with missionaries all over the world, and because we are pretty gray now (although Sherrylee doesn’t show it J), we’ve been through some of it and have talked with others who have been through most of it, God can use us as listening ears and sounding boards for these saints who have served most of their lives abroad. We had that kind of conversation with Craig and Katie, from which we were blessed and hope they were too. During that conversation, however, we realized that we had the opportunity to use the afternoon to train the young people in their Christians On Mission program to be used in the LST follow-up, so hastily Craig called them together and Sherrylee and I spent an hour with about six of their students, teaching them that the Word is the Teacher and that they are the Illustration and what the ramifications of those two principles are for working with unbelievers. Craig and Katie started Christians On Mission for French young people, not as preacher training, but as training to be a strong Christian. Max and Phillippe Dauner also teach in the program. Currently they have students from the US, from Tanzania, and from France. Immediately following our hour of training, we went to their Children’s hour, where about 20 kids met to sing and hear Miss Katie tell them about Easter eggs—and the real story of Easter. During the last part of the hour, Miss Sherrylee got to tell them all about LST and getting their parents interested in practicing their English when the American students are here in the summer. Between the Children’s hour and the Ladies Bible study that Sherrylee was going to speak to, we had 30 minutes. Sherrylee had accidentally wandered into a neighbor’s house, thinking it was part of the church building. . . . ., but it turned out that this neighbor had been baptized a couple of years ago, so as Craig was explaining to the neighbor why Sherrylee had walked into his house, he invited us in for tea and cookies. Khered (?) is his name and he is Algerian. He and his wife want to return someday to Algeria, which could be a great opportunity to carry the Good News with him. He says he is the first Christian in his family in over one thousand years! Think about that! Sherrylee talked to the women’s Bible study about LST, then Craig took us to a little hole-in-the-wall kind of “snack bar” named Ishtar! The owner is Iraqi, an Iraqi Christian—Chaldean Christian. Where do those words take you? To Ur, or the Babylonians, or where? In broken French, a smattering of German, and almost no English we talked with him and his brother-in-law and a couple of other people about the millions of Christians that had been in Iraq and protected under Saddam Hussein, but who were immediately persecuted and killed after the Iraqi War by the Islamic fundamentalist until today there are only a few hundred thousand left, mostly in the north among the Kurds—at least that is the way it was reported last night by these Iraqis to us. As we ate, one of them led us in prayer and then said the Lord’s Prayer in Aramean—the same language Jesus used. It was a special moment. With the flat bread and the wine on the table, it felt like communion. We fell into bed last night, having said goodby to Craig and Katie, but thanking God for them, for the saints here in Marseille, and for the blessings we had received from Algeria and Iraq.